"The battle, sir, is not to the strong alone; it is to the vigilant, the active, the brave. Besides, sir, we have no election. If we were base enough to desire it, it is now too late to retire from the contest. There is no retreat but in submission and slavery! Our chains are forged! Their clanking may be heard on the plains of Boston! The war is inevitable — and let it come! I repeat it, sir, let it come! "It is in vain, sir, to extenuate the matter. Gentlemen may cry, “Peace! Peace!” — but there is no peace. The war is actually begun! The next gale that sweeps from the north will bring to our ears the clash of resounding arms! Our brethren are already in the field! Why stand we here idle? What is it that gentlemen wish? What would they have? Is life so dear, or peace so sweet, as to be purchased at the price of chains and slavery? Forbid it, Almighty God! I know not what course others may take; but as for me, give me liberty, or give me death!" "Let me be buried on this spot!" I know you are busy saving the free world from certain doom and destruction and all that stuff, but please hurry home soon. I feel terrible that you are sleeping in the woods while I enjoy this huge bed all by myself. I asked Captain Knuckle to fetch me some ice cream from the upright freezer in the garage. This is what he brought me. 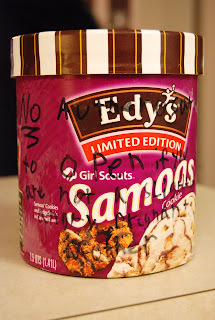 "No authorization to open if you are not a slightly angry pregnant mother."